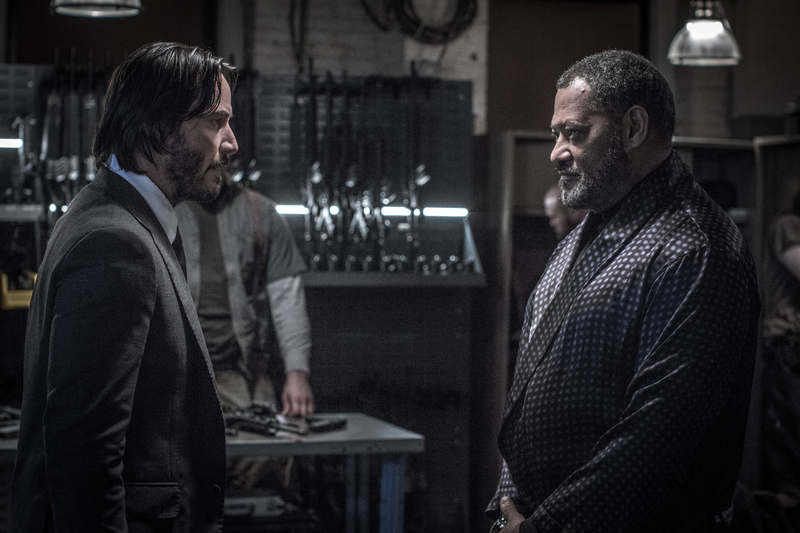 John Wick (Keanu Reeves, left) and The Bowery King (Laurence Fishburne, right) in JOHN WICK: CHAPTER 2. ©Lionsgate Entertainment. CR: Niko Tavernise. HOLLYWOOD–It has been 18 years since Laurence Fishburne as Morpheus offered Keanu Reeves as Neo the option of taking the red pill of truth or the blue pill of status quo that sent him on his cyberpunk odyssey in the now sci-fi classic “The Matrix.” Under the direction of filmmakers Laurence and Andrew Wachowski (now Lana and Lilly, respectively), the actors went on to co-star in two sequels of the worldwide hit. The last one, “The Matrix Revolutions” came out in 2003. Fishburne and Reeves reunite onscreen for the first time since that franchise wrapped in the action drama “John Wick: Chapter 2.” Reeves reprises his role as the title character, a legendary hit man, who at the end of the 2014 original had quit the killing business. He reluctantly is brought back into action when a former associate plots to seize control of a shadowy international assassins’ guild. Bound by a blood oath, Wick travels to Rome where he squares off against the world’s deadliest assassins. The skilled fighter uses his expert martial arts skills including Brazilian jiu-jitsu to defeat his adversaries along with anything else he can use as a weapon, including a pencil. Administering punishment on the criminals that killed his beloved dog, the super-assassin retrieves his 1969 Mustang from Russian mobsters, only to be pursued in a high-speed car chase through New York City. It is in the Big Apple where Wick seeks out the so-called Bowery King (Fishburne) and enlists him along with his underground (literally) army to help him defeat those who’ve wronged him. The sequel is directed by Chad Stahelski and written by Derek Kolstad, who also made the original. Kolstad says he created the role of The Bowery King with Fishburne in mind. Joining the cast is Ruby Rose (“Orange is the New Black”), rapper/actor Common and Peter Stormare, along with returnees Ian McShane, John Leguizamo and Bridget Moynahan, who plays Wick’s late wife in flashbacks. Fishburne and Reeves, both in their 50s, appeared to take delight in their reunion to promote the action-packed sequel. Q: What was it like to collaborate with Laurence Fishburne? Q: What were some of the new things that you were going to bring to the sequel that excited you? 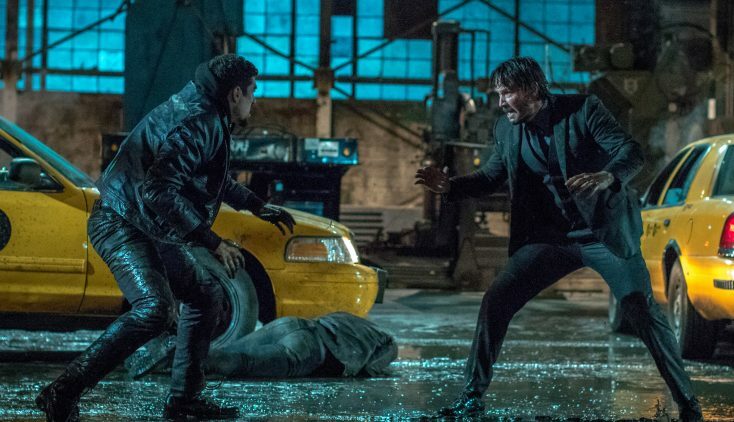 Reeves: That’s why The Bowery King, Laurence, and Common (who plays Cassian, the security chief for a brutal crime syndicate leader) opening up this world of assassins and also with Ian (McShane, who plays assassin society kingpin Winston) where his purview opens up and we learn little bit more about him. Q: You have many action films under your belt. In real life, how good are you at jiu-jitsu and Judo? Reeves: I don’t know any real jiu-jitsu or Judo, or anything. I do movie kung fu. But with that, you can fake a punch, but you can’t really fake a judo throw. You can get help from the person you’re throwing, because they can kind of launch themselves. At the same time, Common got really good at throwing people (including) me. It’s really cooperation, but in the real world I don’t do any of that. Reeves: I didn’t have that experience. You think that he knows something I don’t, but I know something he doesn’t. Fishburne: No. I feel like these are two completely different guys than the guys we are in those movies. The only similarity is that I might know something he doesn’t know when we first meet each other. You think that. (Keanu’s character) knows something I don’t know. So, I just love the world of “John Wick,” all of that, when I saw the original film. I thought, “I’d really like to play with these guys.” I’ve been a big fan of Common and Mr. McShane for a long time. Q: What about this character and story appealed to you? How much training and choreography did you do? How many takes did you have to do? Reeves: You hope to do good work and that you hope they have a chance to be seen and be responded to. For me, specifically with regard to “John Wick,” it’s really cool since the opening of the first one up until now, it’s great to be part of a film that has so much affection for it. It’s very rare for me, so it’s really cool. Q: What was your favorite scene in this film and what was the most difficult? Reeves: Those sometimes intersect. The most difficult can become the most fun. All of the action is difficult, and all of it is a lot of fun. Like after when Common hit me with the car we had that little impromptu gunfight. We cooked that up. I think the Cassian/John fight before we crash into the Continental (hotel window), that was the most difficult fight technically because we didn’t have all the jiu-jitsu experience, it had the guns, and it we had to go through that process of just learning how to walk. Then we were training after we were fighting other fights. Also when you look at it, it has a real combustion and entertainment to it. That Cassian/John fight in Philadelphia, that isn’t so bad, the intimacy of it. Chad also cut out the audio the soundtrack of the music, mano-a-mano. That was part of the development of the fight. In that fight, (Common) was choking me and dragging me backwards and I’m trying to do a reload. Also, you have to understand that this is cooperation. It’s like a dance, a partnership. You really can’t do it without the other person. You have to cooperate. Q: Dozens of people were killed in the first “John Wick,” but only one dog died and audiences and critics were really upset by that. What was your reaction to that reaction? Reeves: People were really affected by what happens to the dog and John. I get it. People would say to me, “I can’t wait to see the (sequel). But you don’t kill another dog, do you?” For the record, we don’t. There are a couple of (actor) dogs in this. In (“John Wick: Chapter 2”), the dog doesn’t have a name. The puppy in the first film is integral to the story, because it’s part of what’s going in his life. It’s symbolic because of it was a gift from his wife. Now, he’s responsible for the beast and so they have a little journey together. It sounded like a man-and-dog road movie.